Look up Relentless in the dictionary and it will say: See Markham Park. 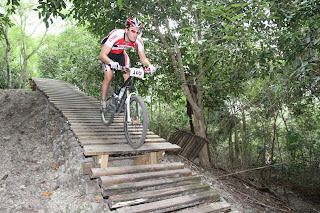 Round #6 of the FSC brought riders to South Florida during a near perfect weekend. Race temperatures were in the 70's. A passing shower in the early morning gave the course plenty of grip. What Markham lacks in elevation compared to other FSC courses, it makes up with challenge after challenge without much chance for recovery. Even when you hit either of the 2 fire road sections, it's time to put the hammer down to keep away from any chasers. Throw in a 3/4 mile flat, mad dash "Parade Lap" into the trails at the start, and racers are going full out from start to finish. The XC3 30-39 class was the biggest I've ever seen. 58 racers lined up at the start!! With not much room for passing in the trails, it was going to be important to get in front early. The whistle went off and my second row start wasn't so smooth with a rider in the front row not being ready to go. I got around him quickly enough to see Julio and a bunch of about 20 pulling away. Because of the long start I knew I'd have a chance to chase back. Alex got knocked around a bit but managed to roll out right behind me. The parade start took us through the Finish line area where I was able to pick off about 10 riders just on the approach to the first corner and I'd creep by another handful riders as I squeezed through a gate that lead us into the trails. Unfortunately the last one was Julio, who I clipped into the gate, causing him to stumble for a second. Sorry buddy!! By the time we hit the first trail I was in the teens, with Julio and Alex not far behind. The first lap went well for me. No bad traffic or bottlenecks to deal with. Catching and passing riders at good moments and I was feeling good. 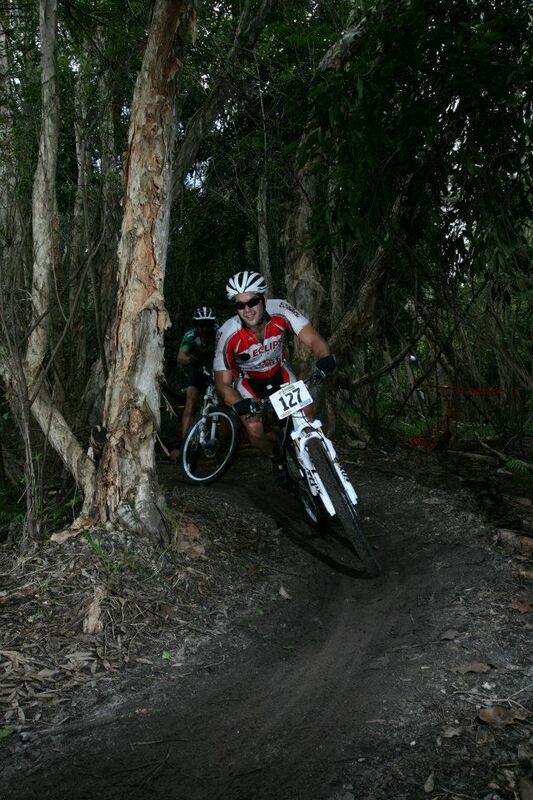 Got passed just before the finish line and crossed in 12th after 1 lap. Julio and Alex had some troubles and were in the high 20s. Lap 2 started out well and I didn't want to let up. I'd been passed but felt it was because I was snoozing on the flats a bit. I didn't let the rider get away and pushed hard to keep up. Combine that pushing with skipping a second bottle in the feed zone and I think I over cooked it a bit. When we hit the Gun Range section about half way through the lap I had to back off a bit. My back went tight and I lost power and felt cramps coming on when I'd try to stand up for power. 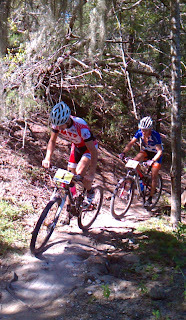 I lost 4 spots in about 10 minutes through the climbing sections to riders that I had passed. I was annoyed. Once I hit the flatter trails I was able to stay sitting and push again. The finish was as exciting as it's ever been for me. Coming down the final flat stretch to the finish I was alone, but being chased by a stronger rider from another class, who was towing someone from my class. When they caught me I managed to pick up the speed a bit and disrupt the paceline so I wouldn't be a sitting duck. When we hit the final turn it was a full on sprint to the finish!! I managed the inside line and held off my chaser into the finish area for 15th place. Best result of the season for me and by far the most fun finish. Julio and Alex would battle it out and gain a few spots on the 2nd lap and finished 23rd and 26th respectively. Our protege Eric Norris (Alex's old nephew) got his first taste of the podium finishing 5th in the novice class! The Pros went off in the early wave and I didn't get to see the whole race, but the Super Cool Bike Shop guys ruled the day with Victor Alber putting in the fast lap of the day on lap 2 to finish 1st. Martin Cox then pulled away on lap 3 to get his gap for 2nd. Kevin Hoffman overcame a deficit on the first lap and chased back to finish 3rd. It was nice to have a little luck go my way after a few rough races. Definitely left a few spots on the trail, but I gave it all I had. Julio and Alex weren't too thrilled with their places, but the next race comes up quick to help them forget. 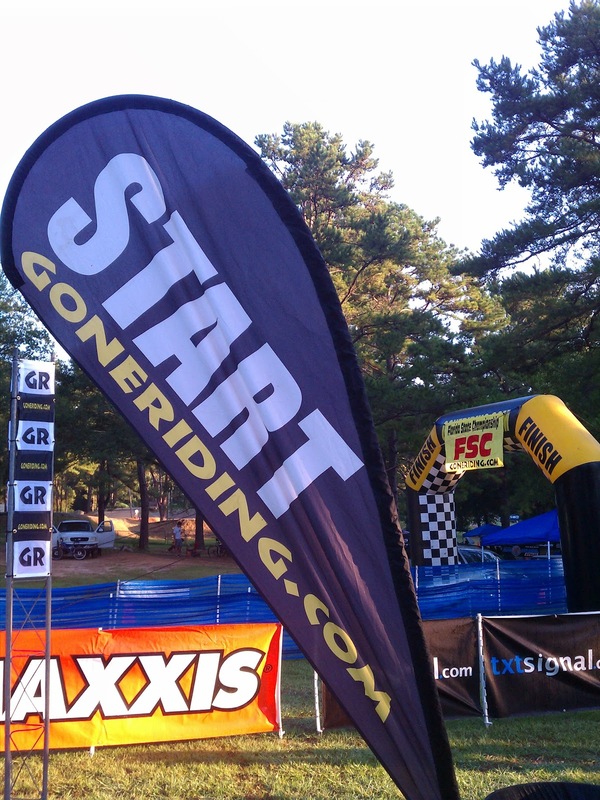 We'll be at the 12 hours of Amelia this Sunday then at FSC #8 in Alva in 2 weeks. Thanks for following along, didn't get many pics this race, and we'll see you in Alva! Eric G here with our race report for race #4 of Gone Riding's Florida State Cup. 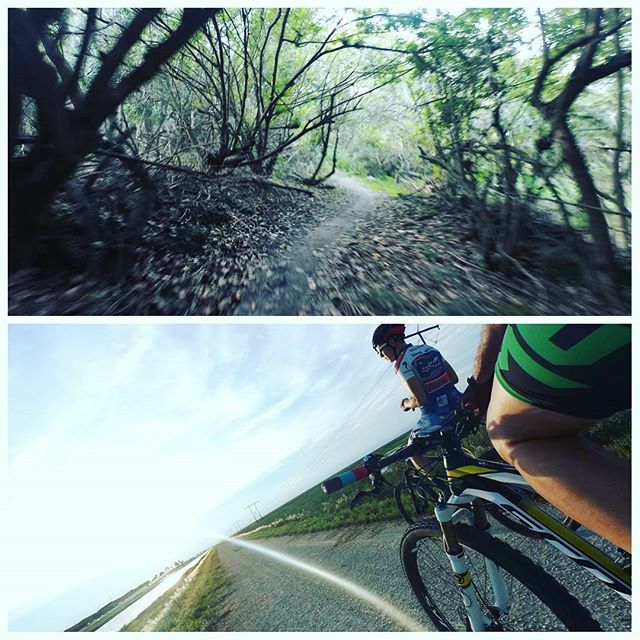 With the first 3 races of the season bringing us smooth, flowing XC race friendly courses, it was time for a change. Tight trails, technical sections, fast drops, and the longest laps of the season greeted the racers at Alafia River State Park near Tampa, Florida. The key here is good positioning going into the first trail as the first few miles are mostly bench cut along the river and streams, which doesn't allow for much passing room. 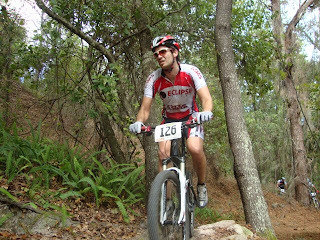 If you manage to start well you must then have the endurance to keep the race pace while successfully navigating over rooty climbs, white knuckle fast drops and swooping roller coasters topped off by the hardest section at the END of the lap. XC3 30-39 field was a large 33 riders and off we went. I spent too much time warming up and got to the line late and started in the 2nd row. Alex got a descent start in the high teens. I got to start LAST....That's right LAST going into the first trail...Unfortunately got my handlebar hooked at the whistle and turned right into the rider to my right. It was either fall or stop, so I stopped and watched the entire field ride off. My chain popped off the chainring also, so I got everything sorted out and took off with a sigh...it was going to be a long day. No disrespect to anyone in my class, but being way back there I just wanted to yell for everyone to get out of my way because I was clearly faster than them at least. But hey it's racing, so I passed when I could, but when there was a HUGE gap already 2 minutes in I knew any chance of a decent finish was gone. Alex was going ok but got caught up in an early pileup and lost a few spots. Sitting in 21st he managed to catch 2 riders from our class but couldn't manage to get around them. About midway through the lap a 40+ rider got in the mix and took a dive costing Alex some more spots while he got rolling again. By then I'd been rolling solo for sometime (turns out I was 25th..yaaaayyy...) and I saw Alex in the tough Roller Coaster Trail. As bad as I felt to chase my own teammate, I had to do it. I was closing down until I got distracted by riders coming behind me. I looked back and noticed they were in another class, but I took a tumble that knocked the wind out of me, and likely cost me the pass on Alex. Rest of the race was uneventful for both of us and we crossed 24th and 25th respectively. Pretty disappointing for both of us considering how much we like this trail. The schedule was a little different this race, so when we arrived the Pro's had already started the first wave. These guys would be riding 3 laps (30 miles) of this course!!! After the first lap, teammates Drew Edsall (just off his 4th place at the Pisgah Stage Race) and Martin Cox had a small lead on 3rd place Allison Anjos. They stayed close together through the 2nd lap as well, with Edsall finally putting some time on Cox for the win. Anjos had a considerable slowdown on lap 3 (Mechanical?) but held on for 3rd place. Next we get a 3 week break (Skipping FSC #5 Alachua) until our home race at Markham Park, which also kicks off the Coconut Cup series. It's been a tough start to the season, but hopefully we'll get some home turf advantage to turn our season around. Thanks for reading as always and enjoy some pics below!! Good luck to everyone in Alachua!!! Race #4 on the FSC calendar will take us to Alafia River State Park near Tampa. This course features the longest laps on the schedule nearing 10 miles per lap. Fast, flowing, roller coasters and technical are all pretty accurate descriptions. It's always a fun course for us to visit. Enjoy a flashback (courtesy of ProEdgeBiker) to 2009 and my infamous Endo early in the race! See everyone at the races! 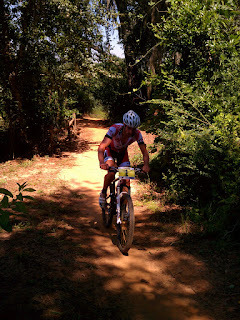 Race report to follow! Climbing in Florida? Most people wouldn't believe it. But that's exactly what Hailes Trails bring to the FSC every year. 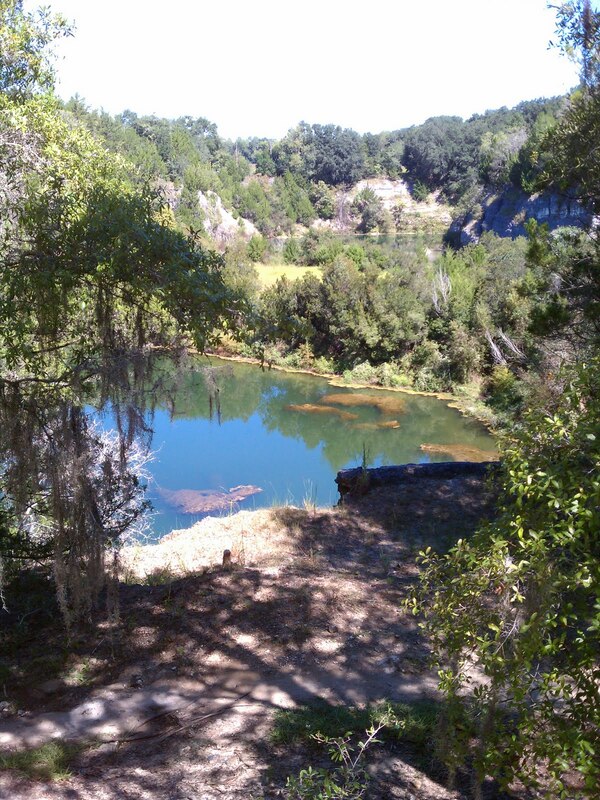 Carved out of an old rock quarry, the course brings almost 300 feet of climbing per lap in addition to some sweet XC singletrack to racers, and is only open twice a year. 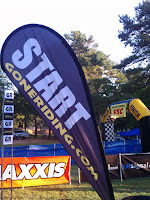 The combination makes it one of the most popular courses on the schedule and was the location of the 2011 FSC Race #3. Julio wouldn't make this event so Alex and I (Eric G) were representing along with our honorary teammate for the weekend Eric N (Alex's nephew) who would be racing in his first FSC event! The drives to the FSC events are always an adventure and this time was no different as we managed to pack 3 racers worth of gear into a Honda Fit (Think packed like a circus clown car) Saturday would host a Team Time Trial, (Congrats on Team Pro Tech for the victory) but without Julio we didn't have enough riders, so we pre-rode the course for a few hours and showed our noob the ropes a bit. Now here's the kicker. That last description was a perfect example of the kind of luck I had all race! I butchered the first major climb when I took the alternate line and was derailed by another rider and had to push up half the climb. I'd gain some spots back, and dismount again in traffic. Gain a few spots...well, you get the point!! I was feeling great but Lady Luck just wasn't on my side this day. She finally had her last laugh when I had managed to fight back into 17th with a stronger 2nd lap and some nice tactics when, I dropped my chain on the 2nd to last climb!!! I'd lose THREE spots just getting the chain un-jammed from the cranks. I was so upset about the events that had just occurred that I almost allowed another rider to pass me on the final stretch. I managed to hold him off for 20th. Considering how good I was feeling this day, I was pretty disappointed. 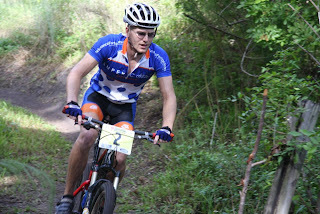 Unfortunately for Alex his day didn't go much better and had a DNF with a major drivetrain issue on the first lap. Only having started riding a few months ago, Eric N had a great taste of the excitement of XC racing. In the novice class he started like a bat out of hell and was first into the trails!! Lost a couple of spots early in his lap and was in 3rd for a bit. Then faded at the end to finish 7th. Top 10 in his first race, not too shabby! The Pro class was exciting as always. It quickly became a race for 1st between Ryan Woodall and Victor Alber as the gapped the field early and never looked back. They'd stay together until the last lap when Woodall would get away for the win. The fight for 3rd was as exciting with Martin Cox and Allison Anjos in a similar battle, with Cox sneaking away for 3rd on the last lap. Anytime you can get out and race it's still fun, so even though our results didn't show it, we still had a great time. The legs were really feeling good this weekend even though things didn't go well. 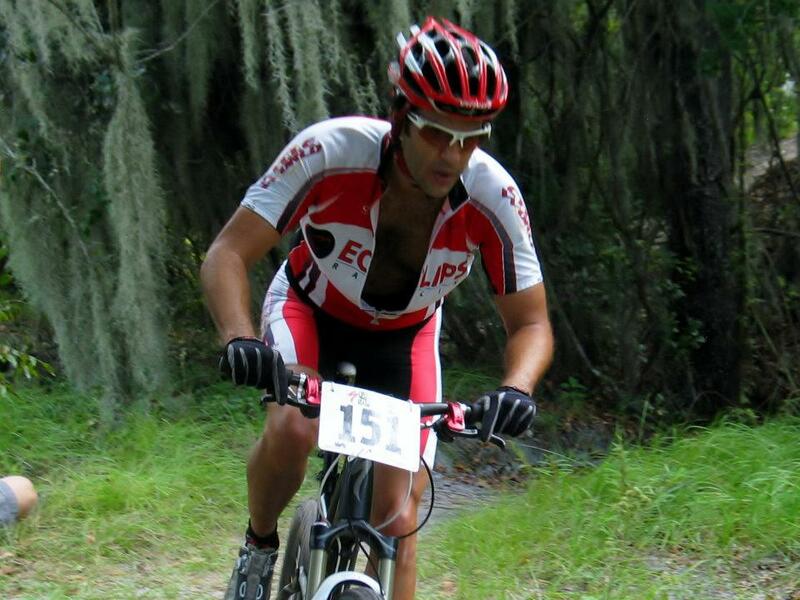 Hopefully FSC #4 in Alafia will be the race we put things together for some results this season. Enjoy the pics below and thanks for following along with us! See you in Tampa in 2 weeks!! FSC continues this weekend at Haile's Trails in Gainesville and racers better get their legs ready for some of the longest, steepest climbs in the state! The action kicks off with a Team Time Trial on Saturday afternoon and the XC will be Sunday morning. The weather forecast is predicting a perfect weekend too! See everyone out at the races! Julio and I made the trip to Tallahassee and were really looking forward to it. Last year was my first visit after a long summer recovering from my broken ankle, and promptly ended 3 minutes into the race with a torn rear tire. So I figured the course OWED ME! Saturday was the fun/recon/Time Trail day, pre-riding the course and catching up with fellow racers we hadn't seen for awhile and then lining up at the end of the day for a Time Trial. After spending the Summer racing around South Florida, I forgot how many racers we see from the whole state. It was great seeing everyone. Julio skipped the TT, so it was up to me to represent the team. I didn't want to burn my legs out so I started pretty fast, but backed off a bit when the going got tough. Just used the TT to get to know the course. 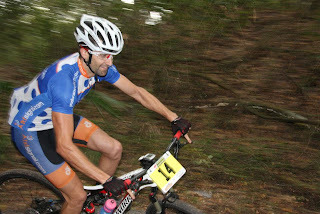 I wound up 17th in the big XC3 30+ class. Sunday rolled around and conditions were perfect. Starting temps must have been in the low 80s and the trail was in perfect condition during our warm up. 34 Racers lined up for our class and off we went. I promptly butchered the launch and took forever to get clipped in and wound up way back right away. 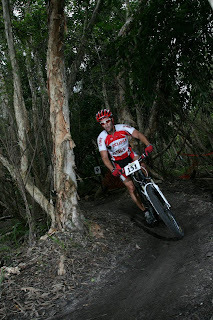 Julio managed better and wound up in the Top 10 going into the first trail. Undulating is an accurate way to describe the course as you're constantly climbing or going down. Nothing too steep in either direction, but enough to separate the racers according to their strengths (This would come to play later for me) Since I was already 20+ riders back I knew I wasn't going to gain any ground early. I followed the quick pace and passed when I could but wouldn't force anything. I'm not the best climber so I couldn't be as aggressive on the climbs, but still managed to gain a few spots. I thought to myself at least Julio is doing well, and then I saw him fixing his bike on the side of the trail....Not good. Turns out he took a minor spill on a sandy turn and dropped his chain. By the time he got rolling he was behind me and a long way from 6th where he was. Despite the setback, Julio fought back and picked off riders quickly and came through lap 1 in 14th. 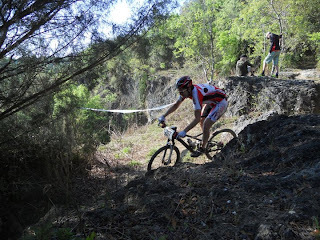 The descents and technical sections suited me, but the climbing was a weak spot. I decided I'd back off a bit on the climbs and not waste unnecessary energy. My strategy worked out as my new good racing friends Pablo Valdeviso, Kirk Ivy and I went at it for pretty much the entire race. They'd catch me on the climbs, and I'd try to pass them as they recovered going back into the trails. Back and forth we went until the final major climb after the Kudzilla section where sure enough Kirk passed me then I jumped around him going back into the trail as hard as I could. I'd manage to hold them off through the end for 18th. Julio had a quiet solo lap and finished 14th on the day.12th-20th were within about a minute of each other, so a better start might have given me a better result. Not the results we wanted, but at least it was a fun tactical race for me. The pro's lined up and were flying at the start. I managed to catch a view of eventual race winner Ryan Woodall putting down an attack that got him the gap he needed for the victory. Watching the fast guys in action is always interesting, but when you can catch a defining attack it's pretty impressive to see how it all goes down. Enjoy some pics from the Yellow Wave below. Feel free to keep any you find of yourself. Thanks for following us. Our next stop will be in Gainesville for FSC #3. See you all then! Get excited for the FSC kickoff by watching how the best riders in the world go at it! If you can watch the full men's race on Freecaster it's interesting to watch the race tactics in a race like this. Enjoy!! Summer is ending so that only means one thing, it's the Florida State Championship Series time!!! 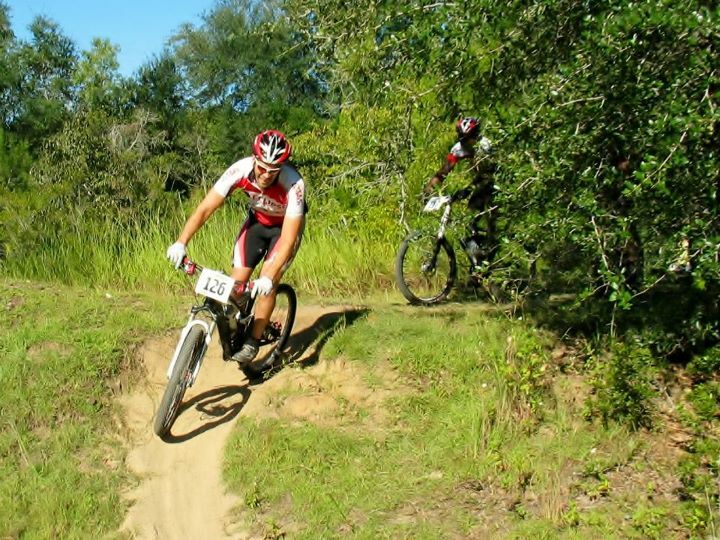 This weeked kicks off the 2011 series in Tallahassee's Tom Brown park, a fast trail with a nice mix of elevation, single track and technical sections to give all types of racers the opportunity to excel. The racing actually starts on Saturday afternoon, with an Individual Time Trial which provides the always interesting challenge of going out hard to place well, but not hard enough to blow up your legs for Sunday's morning racing. Alex can't make it this trip so Julio and I (Eric) will be out there early Saturday for some recon laps and relaxing a bit before the time trial. It's been a long summer so stop by the tent and say hello. It's going to be a great season! So our site went down. Looks like we lost all our content. But we're back on Blogspot until I can get a new site together!! Racing starts in a few weeks so lots of updates to come!